Will I look like you when I grow up? 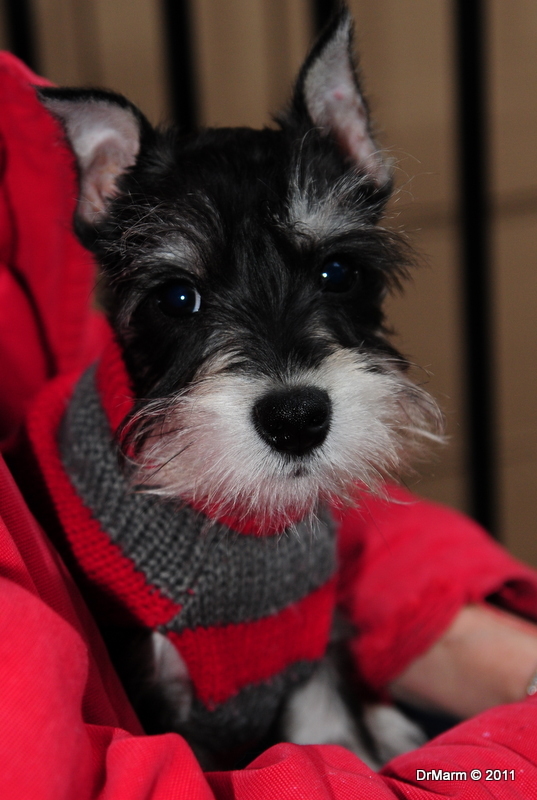 Riley joined us 3 weeks ago, he is a Miniature Schnauzer with black and silver coloring. Born on September 20th, just about 3 and a half months now. 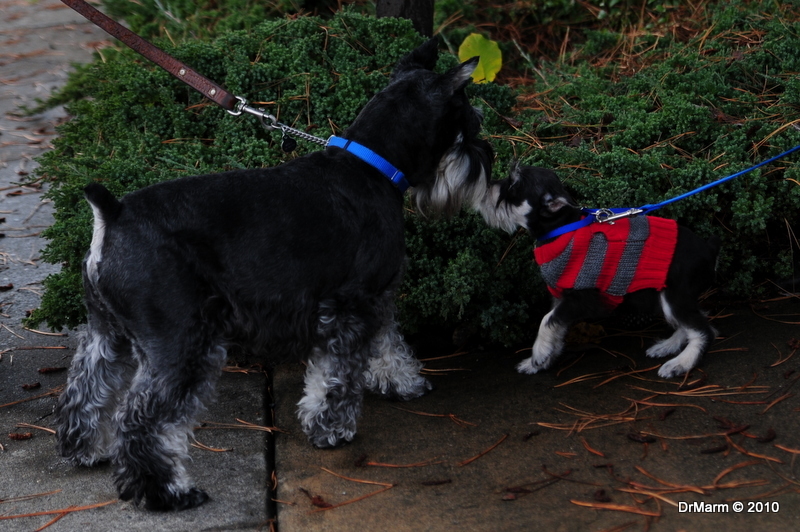 The picture above was when he first met, Benji–an adult version of what Riley will become. I must confess it has been a long time since I have dealt with a puppy and he is curious about everything. Of course, as I type this–by some miracle he is in my lap curled up. Yes, ready for a nap after chewing on the cat scratcher, pulling on my computer cord, and bothering 2 sleeping cats. By the way–cats NOT impressed! 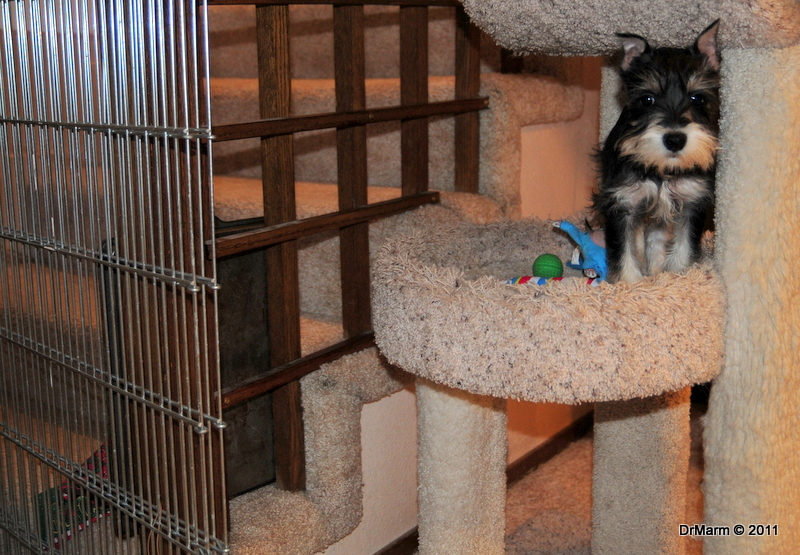 As much work–there is much more joy that comes with watching a new little one enter the family of 3 cats and 1 Cairn Terrier, Roxie. I apologize profusely to folks with puppies that I bugged incessantly to post more puppy pictures! Sorry @Akanaphoto! 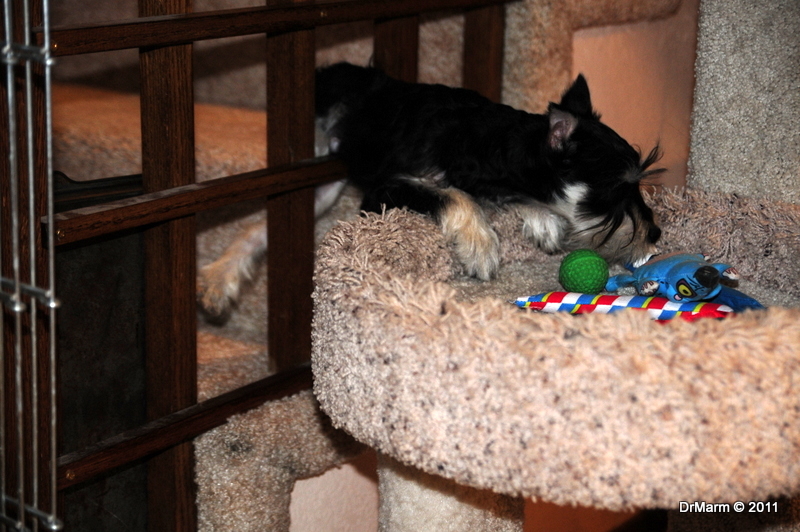 Moto can play for hours with that toy–liked the fact he could watch it move! 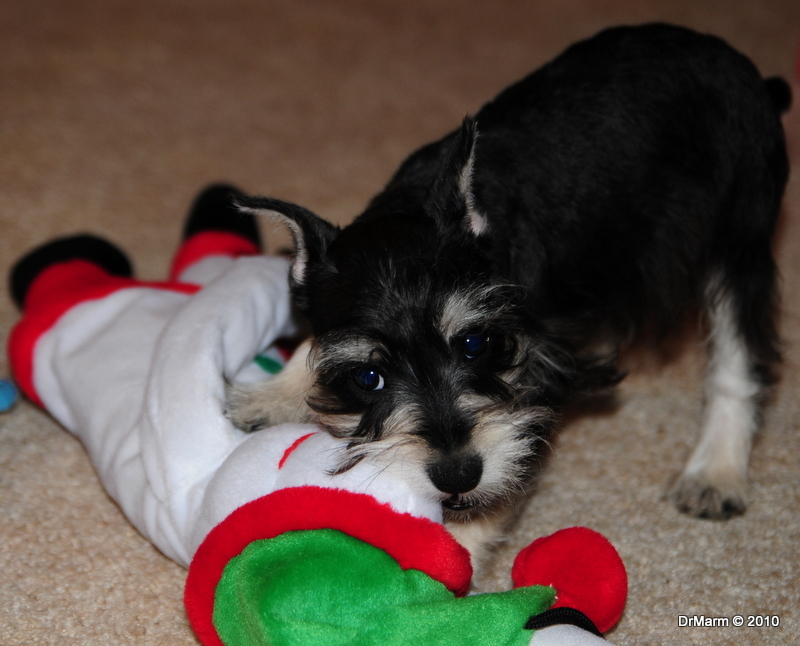 For the record, this toy is longer on the floor–due to puppy interest. Moto still gets to enjoy it when the puppy is in his “Safe Place!” Crate training literature states we should not call it “jail”, but refer to it as his “Safe Place”. Thank you to the inventor of crates!! 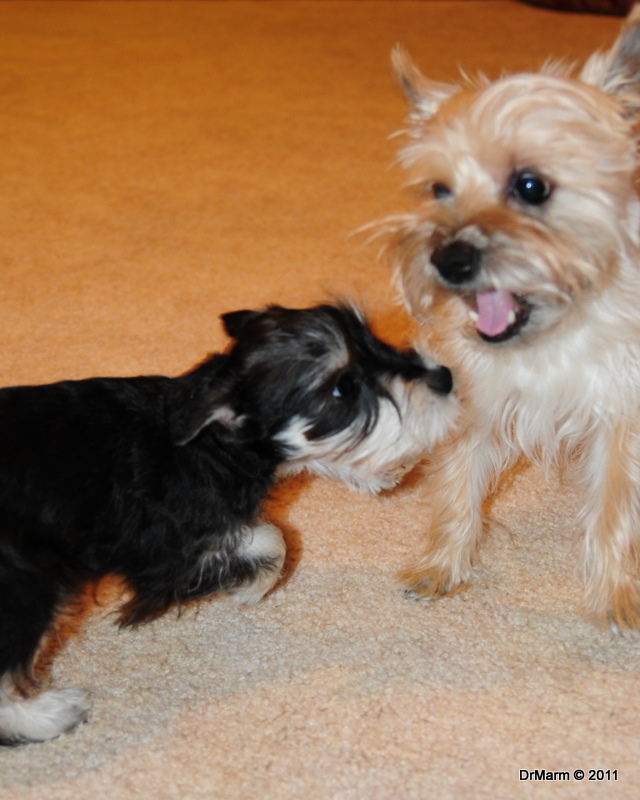 Roxie is enjoying the puppy. Riley bothers her non-stop. She has been very patient and tolerant. Do think in time, he will be bigger than she is. His legs are almost as tall as hers. No animals were hurt during this photo shoot! The good news is that, Puppy Classes start today via Petsmart. I already know who is really getting the training–and it is not the puppy! Roxie and I will watch from the sidelines–and I plan on bringing my Nikon! MUST UPDATE…as I was cleaning downstairs, I found out how un “Puppy Proof” the stairwell really is…of course, my camera was handy!! I want the cat toys! Someone put me here–I swear! Thanks much for your support and comments–thinking there will be more Riley stories to tell! This entry was posted on January 9, 2011 by DrMarm. It was filed under Uncategorized . Oh how adorable! So sweeeeeet! Oh my! Riley is adorable! Look at that face … precious. What a wonderful addition to your family. Looking forward to watching Riley grow up!